“A relentless conservationist and an untiring mentor who takes each opportunity to share his thoughts and insights to all and anyone from all walks of life” is how Ms. Crisi Marie Nozawa, executive director of The Samdhana Institute, describes national scientist Dr. Angel C. Alcala. Apart from being an educator, Dr. Alcala is a marine biologist known for his outstanding contribution to Philippine biological sciences, particularly on marine biodiversity and herpetology. His fieldwork, which added 50 new species of amphibians and reptiles out of the 400 known species, gave international conservationists a reliable basis for establishing conservation programs on Philippine vertebrate biodiversity. Dr. Alcala has conducted research since his days as a student in the mid-1950s. The subjects of his research during the early years were taxonomy and ecology of Philippine amphibians and reptiles supported by grants from the U.S. National Science Foundation based at Stanford University and the California Academy of Sciences, of which he is an Honorary Fellow. He is also an Honorary Fellow of the American Society of Ichthyologists and Herpetologists. 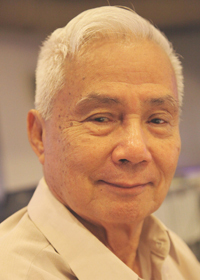 He has published almost every year in marine science since the early 1980s and has authored or co-authored, to date, some 200+ papers and books on Philippine herpetology (mostly with Dr. Walter C. Brown) and marine science, marine protected areas and biodiversity conservation (more than 40 papers, mostly with Dr. Garry Russ). In the early 1970s, Dr. Alcala as biology professor at Silliman University founded the Silliman Marine Laboratory (now the Institute of Environmental and Marine Sciences), which is actively engaged in research on marine science. He established the first working no-take marine reserve in the country (Sumilon Marine Reserve) off southern Cebu in 1974, the Apo Marine Reserve off southern Negros in 1982, and a dozen similar reserves in southern Philippines, particularly in the Bohol (Mindanao) Sea, as well as strengthened the management of about 60 no-take marine reserves in this body of marine waters. No-take marine reserves allows the build-up of marine biodiversity including fishery species as well as export of adult fish to areas (outside of marine protected areas) used as fishing areas, thereby enhancing fish yields of fishers. Apo Marine Reserve is a template of community-based marine resource conservation in the world and is showcased at the famous Shedd Aquarium in Chicago, U.S.A. He continues to promote the establishment of community-based, no-take marine reserves in various parts of the country through visits to various places and through formal lectures and speeches. His initiatives have become a model of coastal resource management and conservation adopted by many countries. Dr. Alcala has had an extensive experience in government service. He served as Deputy Executive Director of the Philippine Council for Aquatic and Marine Research and Development of the Department of Science and Technology from 1989 to 1991. He was Secretary of the Department of Environment and Natural Resources (DENR) from 1992 to 1995, and later served as the first Chairman of the Commission on Higher Education (CHED) from 1995 to 1999. He was Chief Scientist (pro bono) for the Maritime and Ocean Affairs Center of the Department of Foreign Affairs of the Philippine Government (2004-2007) and led three marine expeditions, one to southern Philippines and the other two (JOMSRE III, IV) to the Spratlys, South China Sea. Dr. Alcala works with local government units, NGOs, Peoples’ Organizations and academic institutions including colleges and universities, in programs on research and coastal and marine resource management. He is a member or Chair of boards of the Fulbright Scholars Association, Haribon Foundation, Foundation for the Philippine Environment, PATH Foundation of the Philippines, Worldwide Fund for Nature, (WWF), Wildlife Conservation Society of the Philippines (WCSP),National Research Council of the Philippines (NRCP), National Network of Quality Assurance Agencies (NNQAA), Philippine Institute of Traditional and Alternative Health Care of the Department of Health (DOH-PITAHC), Silliman University, CAP Family of Companies, and Centro Escolar University. As an environmental conservationist, he is an active member of the Protected Areas Management Board (PAMB) of the Balinsasayao Twin Lakes Natural Park in Sibulan, Negros Oriental and the Chairman of the Crocodylus Porosus Philippines, Inc. which has various projects concerning the conservation of Philippine crocodiles. For his achievements in research and development in the areas of herpetology, marine science, and terrestrial and marine conservation, he received a number of awards, among them the Outstanding Sillimanian, the Outstanding Negrense Award for Negros Oriental, the Fulbright Award in Ecology, Biodiversity Award from the Field Museum, Chicago, USA, the Ramon Magsaysay Award for Public Service in 1992, and the prestigious Pew Fellowship in Marine Conservation with Garry Russ in 1999-2003. He was elected Academician to the Philippine National Academy of Science and Technology (NAST) of the Department of Science & Technology (DOST) in 2004. In 2008, The DOST chose him as one of the 50 men and women of science in the Philippines for the period 1958-2008. In September 2011, he received the Gregorio Y. Zara Award for Basic Science from the Philippine Association for the Advancement of Science, Inc. The National Academy of Science and Technology voted him to the Order of National Scientist in December 2013, and was proclaimed National Scientist by President Benigno S. Aquino III through PD 782 dated June 6, 2014. Today, Dr. Alcala is the Chairman of the Board of Advisers of the Silliman University-Angelo King Center for Research and Environmental Management (SUAKCREM) at Silliman University in Dumaguete City, Philippines. He is an Emeritus Professor of Biological Sciences at Silliman University and Adjunct Professor at James Cook University, Townsville, Australia.